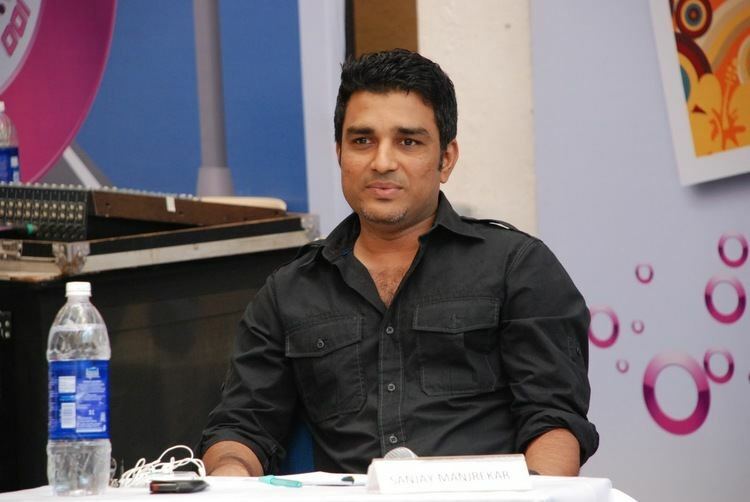 Sanjay Vijay Manjrekar pronunciation (born 12 July 1965) is a former Indian cricketer. He played international cricket for India from 1987 until 1996 as a right-handed middle order batsman. He scored just over two thousand runs in Test cricket at an average of 37.14. He occasionally played as wicket-keeper, and was known for his technically correct batting style. Following the conclusion of his cricket career, he works as a cricket commentator. Sanjay Vijay Manjrekar was born in Mangalore in what was then the Mysore State in western India, on 12 July 1965(since his mother hailed from Mangalore); the son of Vijay Manjrekar, who made 55 Test match appearances for India between 1952 and 1965. As a school boy, he competed in the Cooch Behar Trophy between 1978 and 1982. He attended Bombay University, and played in the Vizzy Trophy and the Rohinton Baria Trophy between 1983 and 1985, winning both in 1985, with West Zone Universities and Bombay University respectively. He made his first-class cricket debut on 7 March 1985, scoring 57 runs in his only innings for Bombay during their Ranji Trophy quarter-final victory over Haryana. He retained his place for the semi-final, but did not play again after that until the following season. He performed steadily in 1985–86, averaging 42.40 with the bat, though his highest score was 51 not out. The following season, he struck his first century in first-class cricket, remaining 100 not out during the first innings of a match against Baroda. He scored one other hundred that season, and his seasons average was 76.40. He struck a double century for West Zone in October 1987, scoring 278 runs from 376 before being run out. In late 1987, he made his international debut, facing the West Indies in Delhi. He scored five runs in the first innings, and ten in the second, when he retired hurt. His first half-century in international cricket was made against New Zealand in December 1988, during a One Day International. Manjrekar scored 52 runs during a narrow victory for India. The following April, he scored his maiden Test cricket century, hitting 108 against the West Indies. He scored his second Test century in November 1989, against Pakistan. In the fourth innings of the match, he scored 113 not out to help India draw the match. In the third Test of the same series, Manjrekar made his highest score in Test cricket, reaching 218 runs in the first innings, before being run out. He did not score another international century for two years, when he hit 105 runs from 82 balls in an ODI against South Africa. Domestically, he enjoyed success in the 1990–91 season, scoring four centuries and one half-century in eight first-class appearances. During the season, he scored his highest total, 377, in the Ranji Trophy semi-final against Hyderabad. He played in the final of the 1994–95 Ranji Trophy, scoring 224 runs to help Bombay to a total of 690/6 declared in their first innings, a total that saw them win the trophy.